Using the Raven Tools CRM system for Affiliate Management. One of the most important things that an organized and effective Affiliate Management Company can do is to properly track and organize their Affiliates. You want to properly tag them, database them and make sure you update their information. This way you can pull their information out when you need to get a hold of them, mail similar groups when you have something to say and also send them thank you cards, holiday cards or gifts if you want to reward or surprise them. Even if your SEO team is using the Raven Tools CRM system, you can easily add in your Affiliates and separate the two. The system is basic like I said before, but it can also be helpful if you don’t have another or more advanced CRM system. If you look above you’ll see that by searching for an Affiliate’s name or site I can easily locate them. Once their record is pulled up I can then go ahead and find their twitter pages, their websites, etc… I can keep track of notes, complaints, the last time I reached out to them, past comments they made about things they want, like or need, etc… I can also create tasks and reminders to follow up with them. If you are working on 20 projects with 20 different Affiliates, it can be hard to keep up with everything. That’s why the Affiliate CRM system will help you to organize everything you need to do and remind you when you forget to finish something for someone. Again, it is not as advanced as a full Affiliate CRM System, but it is good enough to do what you need to do in my opinion. You can also export your Affiliates so that you can email them as a group or segment them for separate messages. Tasks are something that every Affiliate Manager needs to keep up with. You have to make sure your newsletters go out on time, you get content written or storefronts built for partners as well as everything else you owe your specific partners or groups. By setting up tasks and reminders inside you can get reminders that will help make sure everyone has what they need, you don’t forget anyone and that you can help your program can continue to thrive. What I like about the tasks inside the Affiliate CRM System in Raven Tools is that you have contact method as an option. Every Affiliate is different. Some hate emails, some hate phone calls and others just want to see it on your blog instead of having you reach out to them. By knowing how you have to follow up, what you have to do and by reminding yourself of their preferred contact method you can help to ensure a happy working atmosphere by keeping your partners happy. If it is something you need to do on a regular basis, you can also set it up as a recurring task. One other thing you can use this task sheet for is a reminder to reduce commissions after promotions, remember to reward bonuses for specific partners or to check their sales for cancellations to make sure you bonus them the right amount. The task and reminder or recurring tasks are vital to any Affiliate Manager who needs to keep up with everything they have to do. If you don’t have enough requests in, you may not be doing something right. If you have custom deals like X amount of sales that don’t have X amount of cancelled sales within X amount of period then the partner gets XYZ bonus each month, you can remind yourself of the promotions, promised bonuses and everything else Affiliate by Affiliate. This is something I was relying on Outlook for, but now I have a real system where I could start having it remind me and keep track of all notes and progress in one place. If you give different incentives or bonuses to different Affiliates or over random time periods, then this will be a life saver if you aren’t currently using it. The next thing that I love about using Raven Tools for Affiliate Management Software is that it has a way for me to keep track of my Social Media and regular Affiliates that use social media and their posts. Because I can enter in their Twitter accounts, etc… I can pull their feeds. If I look at referring urls coming from social media sites I can then log in and in one place pull each partner that is sending social media traffic and check for FTC disclosures, trademarks being used, etc… This is an extremely easy way to do quality control, check for people using your brand as Hashtags, not using FTC disclosures, etc… in one place and Affiliate by Affiliate. This is probably one of the most power Affiliate Management Software tool features you have within Raven. Because it goes Affiliate by Affiliate you can switch through them quickly instead of having to search twitter, try to find the hash tags, etc… This could be a giant time saver. Unfortunately my computer crashed while I was writing this post and the other things I wanted to talk about got deleted. Because of that I get to do a follow up post. Unfortunately it also means I have a ton of catch up work to do and didn’t get to properly edit this post so I hope it reads ok. If you want to know my recruitment secret that can help to find your competitors partners and give you a way to potentially grow your program, then feel free to leave a comment with an email to reach out to you with. I won’t post the comment, unless you ask me to and I’ll erase your tracking number and sale information. 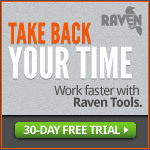 You’ll just need to buy RavenTools through my Affiliate links first so you can use them to do it. If you don’t have Raven then you can’t use the trick. Thank you again for reading and sorry for cutting this post short. Raven Tools ended up becoming a pretty cool Affiliate Management Software that helps you to manage a program. It doesn’t replace a network because you need tracking, payments, datafeeds, etc… but it does give you a way to manage your day, follow up with partners, monitor them, group them, reach out to them and keep up with everything you need to do to make yourself an effective Affiliate Manager.